In 2010, Plastiki, a 60-foot catamaran constructed out of 12,500 plastic 2-liter bottles, made an 8,000-mile journey across the Pacific Ocean in an effort to raise awareness about plastic waste in the ocean. While the trip grabbed headlines at the time, the boat has been out of the spotlight since making the San Francisco-to-Sydney, Australia crossing. After sustaining some damage during the trip, the boat went through repairs in Sydney before being shipped back to Los Angeles earlier this year — a little more than 400 miles short of its intended destination — San Francisco. But, thanks to the helping hand of Vessel Assist Capt. Chase Henderson and his crew, the boat is back in its homeport and is expected to be on display during the 2013 America’s Cup. In an interview with The Log, Henderson explained how his company got involved in towing the plastic behemoth from San Pedro to San Francisco, and the adventures along the way. The Log: What’s your background with towing? Henderson: “Although I had worked in other forms for Vessel Assist in the past, I was first hired on as a captain in 2009 by Vessel Assist Catalina at 18 — the minimum age to hold a Coast Guard license. How did you get involved with towing Plastiki? Who contacted you about the job? What did you think of the plan? What exactly was the job? Is this something the company has done before? Did you encounter smooth sailing the whole way? “The first 24 hours of the tow was excellent. It was completely calm and the sun was out. But like clockwork, when we neared Point Conception, the wind speed increased and sea conditions worsened. 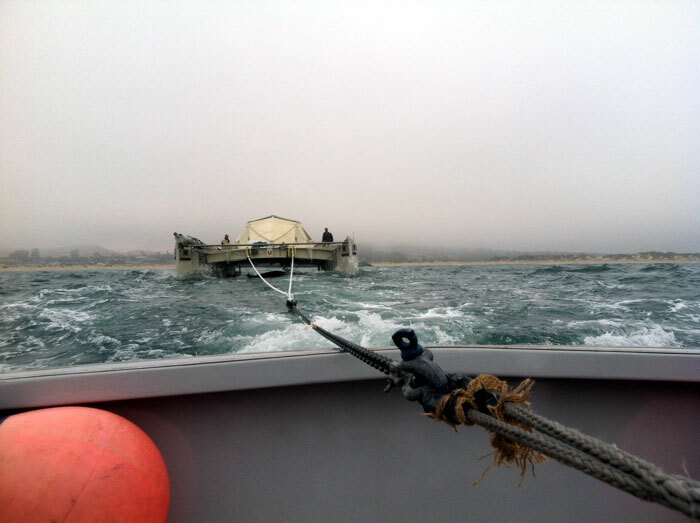 Through that night, we faced 25- to 35-knot winds and charged uphill through very short interval 7- to 10-foot swell. What did you bring for supplies? Who was on hand for the tow?